The very finest breakfast, lunch and supper meals, that are both healthy and tasty. "Time set aside for healing, detoxification, weight loss and breaking addiction"
Let me start by way of a disclaimer: Freedomyou does not advocate permanently restricting your diet to raw foods. The nutrients in some foods cannot be assimilated properly unless cooked. Also, food has importance beyond its nutritional worth. Rawtarians may argue the virtues of their restrictive diet, but how does one quantify the value of a delicious well-prepared meal? The mélange of color, fragrance and taste says it all. Much like fasting, a raw diet is a set period of time for cleansing and healing and can also be extremely effective in weight loss and overcoming food addictions. In some ways it is more effective than fasting. Due to the bulking nature of all raw foods and the fact that your digestive system is still active, you can actually experience greater weight loss during a raw diet than when juice fasting, ingesting less calories while metabolism remains normal. Juice fasting allows a break from hunger whereas a raw diet forces you to face both hunger and craving together. There is a learning curve when trying to change from a diet containing a lot of toxic food to a healthy diet. Eating only raw food simplifies it all. Think about it, restricting intake to raw foods does away with the unhealthy elements found in our common diet, establishing a new eating mindset. This is important because most of the battle is in the mind. Raw fruits and vegetables are fabulous mucus-cleansers. They facilitate the removal of excess mucus and toxins, supplying vital nutrients in correct balance for rejuvenation and healing. Protective compounds and phytochemicals support the immune system and ward off aging. Studies have shown people who eat a generous amount of fresh fruit and vegetables on a daily basis have the least amount of all types of cancers. 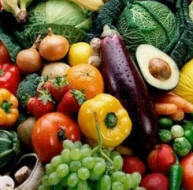 Raw fruit and vegetables are filled with enzymes. A high source of these enzymes is in the green leaves of plants which help protect the body from many cancers. Craft a raw diet according to the goals you have set. Looking for a safe, fast way to lose weight? Then reduce heavy foods like raw nuts and manna bread and increase low-calorie, bulking veggies. If detoxifying is your goal, then incorporate more fresh juice, and eat lots of greens and color-rich fruits like melons. Wanting to break food addictions? Then I suggest not limiting the richer foods, especially on the front end. After ten days, you can start to cut back and see how you feel. Some may naturally transition into juice fasting. Be sensitive to your body, but more importantly, stay in tune with where the Holy Spirit is leading with this open door you have given Him. As I have said before, this will not be easy, so be prepared to face some painful emotions. You can do this one day at a time. When discouraged, focus on the amazing good you are doing your body and how liberating it will feel to be back in control of your eating.